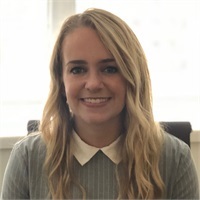 Sloane joined Wealth Advisory Group in September 2018 as a Recruiter. Previously, Sloane worked in technical recruiting in Washington D.C., placing top tier IT candidates for federal and commercial clients. Sloane takes pride in the fact that the people that she brings to the Wealth Advisory Group impact the community positively. Sloane attended college at the State University of New York – New Paltz, where she majored in English and was captain of the women’s soccer team. An avid runner, Sloane volunteered as Head Coach for Girls on the Run, a national organization promoting confidence and appreciation for health and fitness in underserved cities. Outside of work, Sloane snowboards, practices yoga, and repurposes furniture.